Rcmadiax has made several games on the Wii U eShop from Pixel Slime U to Don’t Crash. 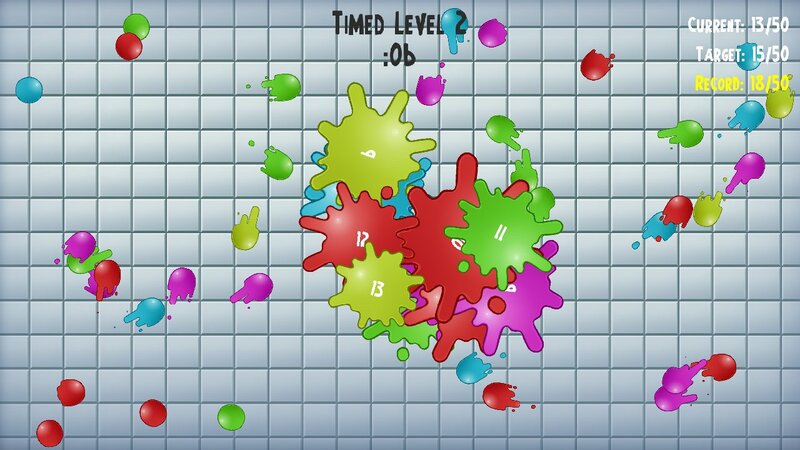 And now their latest game, Color Bombs, claims to be the “messiest chain-reaction game ever”. But is this game the fun “paint filled” experience that they promised, or does it fail to deliver on that promise. First, let’s start with the gameplay which is pretty boring in all honesty. You move a small circle in the area that you want it in and when you’re ready to launch it, you press the A button and when a blob of paint hits it then it will splat, and if other paint blobs touch it then they will splatter too. In order to pass a level you have to have a certain number of paint blobs splatter before the splattered ones disappear. 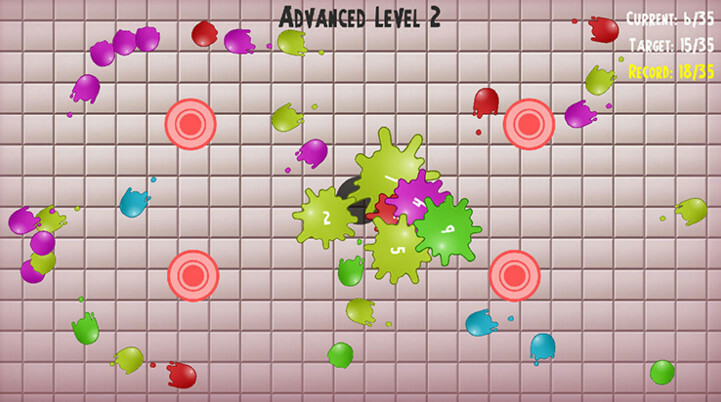 The problems is that it’s very easy to get the right spot on the screen and when it happens, almost every paint blob will be splatted which doesn’t make the game feel very challenging or hard most of the time. There are 60 levels in the game all together, 20 regular levels, 20 advanced levels, and 20 timed levels. But, because of how easy it is to reach the goal of each level, it doesn’t feel very challenging most of the time, even in the advanced levels. And because of that, I ended up beating every level in the game in about 30 minutes, which left me feeling underwhelmed and bored through most of my playthrough. So overall, what do I think of Color Bombs? I didn’t like it very much. The gameplay was boring and repetitive, there were tons of technical issues with the game, there was a serious lack of music or sound effects, and overall I didn’t feel like I was having fun while playing. If you’re curious about the game because of how its only $1.49 on the eShop and you don’t really mind the problems I mentioned then I’d say go for it, otherwise I’d say that you should just pass up on the game and move on. Overall, I didn’t really like Color Bombs. Is it worth the price? : Maybe. I would recommend it to: People who like chain-reaction games or who are curious about getting the game.